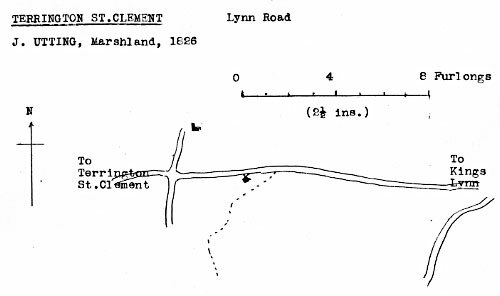 Terrington St Clement postmill stood on the Lynn Road and was built as an open trestle mill with approx 5 foot piers. The mill was powered by one pair of single shutered patent sails with 9 bays of 3 shutters and one pair of common sails that powered a single set of stones. The sails, unusually, travelled in a clockwise direction, clearing the ground by about 2 feet and the mill was turned to wind with a tailpole. Later a single storey roundhouse was added, probably at the same time as a second set of single shuttered patent sails, each sail having 8 bays of 3 shutters. The mill buck was extended to accommodate the windshaft and a fan was set on the tailpole. N.B. Many fields at Terrington St. Clement were named Balsam Field so this mill has no connection with Balsam Field towermill near the Railway Station. To be Let For a Term of Years to be agreed on between the parties and entered upon at Michaelmas next if required. A POST WINDMILL in good repair, with a comfortable Cottage adjoining and seven acres of Land near the Cottage on which the mill stands. Apply to Mr. W. Sarginson, Terrington near Lynn. To be Let and Entered upon Immediately. 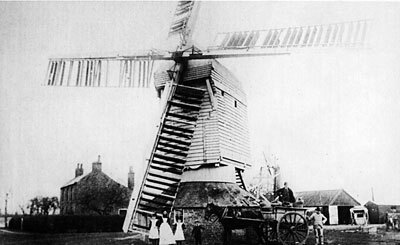 A Capital WINDMILL in good repair and seven acres of Land with a new built Cottage thereon, adjoining the Mill, situate in Terrington St. Clement in the county of Norfolk, near the road leading to Lynn, now in the occupation of William Sargison. Apply to the said William Sargison or Mr. Braithwate, Attorney, Lynn. ... Mr. Sargisson, Terrington St. Clement, Miller. Wanted immediately, a Single Young Man as MILLER and CARTER to live in the house. For further particulars apply to Mr. R. Flatt, Miller, Terrington St. Clement, near Lynn, Norfolk. Wanted immediately, a SINGLE MAN to live in the house, to assist in the mill and drive a cart. Apply to Mr. Robert Flatt, Terrington. Begs most respectfully to inform the farmers and inhabitants generally of Terrington and the neighbourhood, that he has taken the above mill and hopes by prompt attention and honourable dealings to merit the support so liberally bestowed upon his forefathers for the last 60 years. N.B. The business till October 11th will be conducted on his behalf by Mr. W. G. Flatt. During the recent gale three of the sails on the mill of Mr. Flatt were blown off and Mr. Flatt narrowly escaped serious injury from the falling materials. WANTED, a Miller (single man) to take charge of a Bag Mill and to make himself generally useful. Apply personally to J. Overton, Terrington St. Clement. Single man wanted as Miller to take charge of a Grist Mill and make himself generally useful. Apply personally to J. Overton, Miller, Terrington St. Clement. To Millers. Single man wanted to take charge of a grist mill and to make himself generally useful. WANTED, a steady single man as Miller to take charge of a grist mill and to make himself generally useful. Apply to J. Overton, Terrington St. Clement. WANTED, steady man as Miller & Baker. Good references required. Miller. A Steady man wanted, married or single. Apply to J. Overton, Terrington St. Clement, Kings Lynn. MILLER & BAKER - Wanted a steady man; must be able to manage either. Good reference. A 7 h.p. Portable Engine by Fowler & McCollin, with 4 ft. extra driving pulley. To be seen upon the premises of Mr. John Overton, Miller, Terrington St. Clement. The Materials of a Wind Mill as now standing in a field at Terrington Saint Clement occupied by Mr. John Overton. The whole of the site to be cleared and materials removed by the purchaser within one month from the acceptance of tender. Important Notice To Millers, Builders, Bricklayers, Farmers etc. Are instructed by Mr. J. W. Slator to Sell on Thursday next the 24th inst. at 2 o'c the MILL AND CONTENTS lately in the occupation of Mr. Overton on the Lynn Road, Terrington, comprising 1 pair of 4 ft. 4 in. French stones with irons, segment and pinion equal to new, a valuable lot of oak and Memel timber, fencing wood, bricks etc. The Auctioneers beg to call particular attention to this sale, there being a lot of most useful stuff.